What happens when the Swine Virus breeds with the Avian Flu? 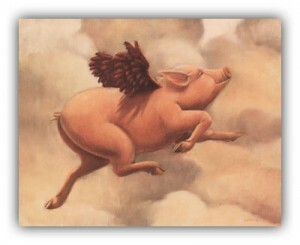 Pigs Fly, of course. Welcome to the end of time. I’m off to collect a few debts. This latest data point is the most recent in a string of bizarre crimes that I have been tracking in my capacity as a double agent (in the Kierkegaardian sense). And, the E-Coli in the Spinach resulting in CNN journalists looking directly into the camera and instructing kids not to eat their green leafy vegetables. Good riddance to the age of Biblical Myth. Welcome to the Age of Marvel and DC. Now, if only I could figure out which organization this intentionality emerged from. erm, jonah? minor correction, none of the other incidents actually happened last year. Using the Gentle Calm theme designed by Phu Ly. WordPress took 0.532 seconds to generate this XHTML page.